(Newser) – The unarmed black man shot dead by police officer Betty Shelby in Tulsa, Okla., last month had PCP in his system when he died, according to a toxicology analysis in an autopsy report released Tuesday. 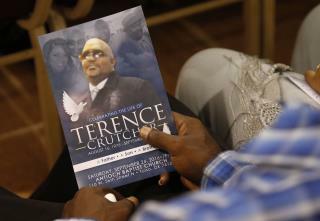 The Oklahoma Chief Medical Examiner's Office says the hallucinogen was found in the blood of 40-year-old Terence Crutcher, along with trace amounts of tenocyclidine, a similar drug, NBC News reports. The report says Crutcher had 96 nanograms per milliliter of PCP in his bloodstream, enough to cause "acute phencyclidine intoxication." Crutcher was shot dead with his hands up beside his vehicle after officers responded to reports of a broken-down SUV on Sept. 16. His hands were NOT up! Addicted to PCP? Ah, no. When a person takes PCP he/she is a danger to society, especially driving a vehicle.